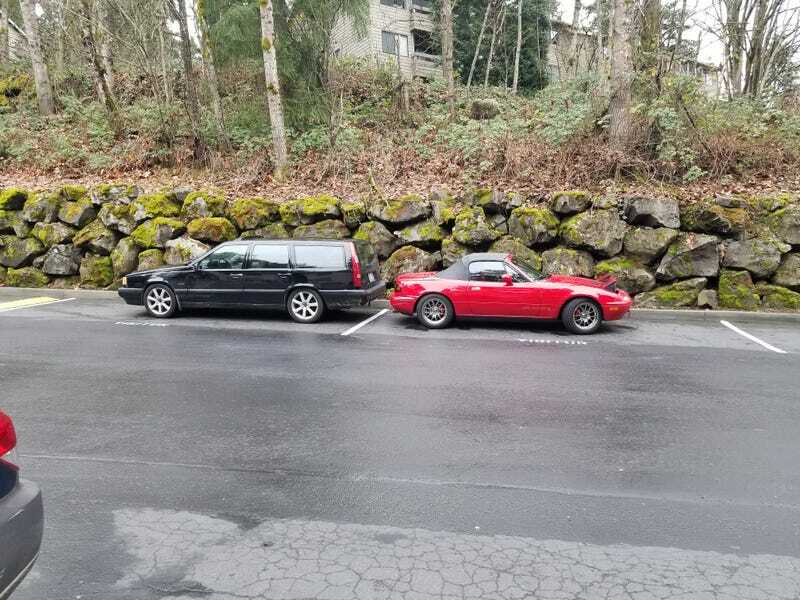 The wagon is preeeetty slow off the line due to traction issues and maybe other things, I honestly think the Miata would crush it in a... Oh I don’t know. 25 ft dash? 50? Even on snow tires the Miata hooks instantly, zero wheelspin. Volvo... Not so much. That said, if the Volvo is already going 15+ mph and you bury the throttle... The acceleration is explosive. Bag-of-bricks to the face levels of OOMPH. Light turns green and I slowly take off, not super comfortable sharing a lane with a bike, so keeping the speeds low until I pull ahead or he decides to rocket past me. I’m letting my rpm climb in first, getting those nice 5 cylinder burbles out in the open. He stays back behind. I keep seeing the bike’s headlight behind me flashing and almost disappearing, only later did I realize the guy was probably doing wheelies. Oh and did I mention how great the exhaust sounded? Next stoplight the other guy comes up too, and mentions his old LS-swapped 240 wagon, saying that he loves the sleeper look. Fun drive home. My commute doesn’t have any curvy roads anymore, but it has some great straights, with high speed limits, no cops, great sight lines, and generally very little traffic. Perfect for the boosted brick. This leaves me with two thoughts. One, I still feel like this wagon is one of the best all-around enthusiast vehicles out there—assuming it’s working—and if I could go back, I wouldn’t have picked anything else. And two, boosted Miata with 250-300whp and ft/lbs of torque, minimal turbo lag and a bongo cat sticker would probably ruin every other car for me.